consistently brought to the market innovations in technology and design. Several of our designs have won awards, the most recent being the Steamon Vortex Flowmeter which has won the iDesign award for the Best Design in Capital Goods. To know more about what drives innovators at Forbes Marshall, write in to us at response@forbesmarshall.com . 'Every designer is an entrepreneur. But every entrepreneur is not a designer.' I believe this very strongly. To be a designer demands that you know how to work your way, collect resources, marshal approvals, and reach the objective. Designers as entrepreneurs need to remember these five inspirations from the honey bee: Sting, Size, Hive, Buzz, and Honey. 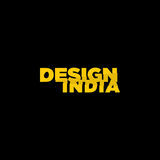 Designindia was founded in 2002. It was started as a platform for interaction for the design community in India and abroad. Over the years it has grown into a forum spread over many social and professional networking domains, linking design professionals into an active, interactive and thought leading community. LETTERS FROM SULEKHA Even as a child Sulekha Rajkumar was fascinated by the art of drawing letters. She tells POOL about her passion for typography. with drawing letters in different styles for class projects. The title and contents pages were always my favorite. In my third year at Sir J.J. Institute of Applied Art in Mumbai, I specialized in typography and lettering under the mentorship of Professor Vinay Saynekar. Apart from being an extremely talented type designer, he is an inspiring guide. He managed to strike the perfect balance between sharing his vast experience and encouraging us to develop our own individual styles. Thereafter lettering has always played a primary role in the work I do. What was your first major design project? SR: After college, I worked with Grandmother India, a Mumbai-based firm known for their very experimental and unconventional approach to design. My learning was significantly enhanced working with Kurnal Rawat, who was the Creative Director at the time. I worked on two major projects with them – Colour Next by Asian Paints, and the publicity and title design for the film Teen Patti. 'Colour Next' â&#x20AC;&#x201C; Asian Paints Designing a typographic planner for Colour Next by Asian Paints. Earth Song is a colour trend for the environment consious. It was brought to life using typography based on the recycle symbol and paper craft. PRIVET - Privet is a display typeface inspired by Russian typography. It is currently designed in three weights – Regular, Demi and Bold. Graphic Design different scripts, music, art and cuisines. I look forward to self initiated projects that marry design with traveling. What has been your biggest learning experience? SR: As designers, we can get very attached to the work we do. It is so important to embrace rejection of your work along with the praise. Four very intense yet enjoyable years at JJ have equipped me with the confidence to push for what I believe in and have taught me to be open to criticism and other points of view. Ranga Shankara - Shakespeare. Multilingual. Indian. Communication for Ranga Shankara Theatre Company's annual theatre festival. Custom monograms for wedding invites and personalized stationery. infographic I am a Brand and Marketing Advisory Partner at t2c - I work with entrepreneurs in Venture Development in the area of Business and Brand & Marketing. What kind of research was involved? BT: This infographic is the result of gazing at the fundamentals of the marketing practice and comparing it with how we are operationally implementing in organizations. The typical marketing structure today is role based; we believe it should be based on the key activities instead. The key activities for marketing are Acquiring, Retaining, and Developing customers profitably, and this was an important insight into developing a structure which can be measured as well as be flexible to accommodate many different types and size of organizations. lifestyle design Tell us more about your products. A&T: We draw inspiration from patterns and culture around us and our products are a modern reference to contemporary life. Amalgam emphasizes on customization and innovation: an array (of patterns, textures, colors) of materials is available, which are amalgamated with the client’s requirements and function. Apart from furniture, Amalgam manufactures various home and lifestyle accessories in wood, stone and inlay in MOP and semi-precious stone; table tops, cheese platters, trays, coasters, placemats, table mats, hardware, etc. We also customize walls and facades. design, every product is viewed as a blend of function and esthetic, tradition and modernity, style and utility, color and pattern, technique and retro style. 'Breda' - Posters on the rising use of photo manipulation tools that have effectively changed our perception of beauty. These posters won the Graphic Design Festival Breda poster competition and were displayed around the world as part of a mobile exhibition. 'Orwellian' is an upcoming typeface based on George Orwell’s 1984 and Caslon’s Italian. typography printing, collage or just plain drawing. It gives a very personal relationship with the work whereas digital work will always have a sense of detachment. Sketching is a very integral part of my design process. It has evolved over time but drawing ideas and constantly doodling forms a foundation to any digital work I do. It’s very interesting for me to look back at my sketchbooks from the past. They reflect my interests and stylistic obsessions at the time of use. But purely as a step in the design process, drawing is very important to me. I often find myself lost and staring at the screen while designing type if I haven’t drawn the letters beforehand. I don’t draw the final perfected letters on paper but to understand the contours and the character of the shapes and how the visual language is followed among all the glyphs in the set, it is very important to draw them first. Do you have a favorite project? SN: I really enjoyed a recent project that I did for MICA. Called ‘’The Empathy Project’ (TEP), it was an exhibition and identity design project that far exceeded the intended brief and I was given free rein as a designer. It was an interactive art exhibition initiated by multi disciplinary artist and musician Paul Rucker and curated by Marcus Civin. The idea was to explore ‘empathy’ as a tool to celebrate diversity. Through the project the artist invited the MICA community to contribute work exploring one’s own experiences with empathy. As the designer of the identity and the exhibition space itself, I had to design a system that would bring together all this diversity under one banner. I had to create a visual language that could act as an umbrella for the varied styles and techniques used to create the submissions. It was an interesting challenge and my first time doing a large scale project. The target audience comprised artists and designers so it was somewhat like cooking for a group of chefs! typography hand is a system, letters drawn to work in any composition, with any arrangement of letters. The work of the aforementioned calligraphers is strictly lettering. I wanted to create a typeface that works in the grey area between lettering and typeface. MoUA - Branding and custom typeface design for the Museum of Urban Art (A class project at MICA.) The subsequent typeface, 'Enemy' is now commercially available through Lost Type Co-Op. Product Designer Mukul Goyal’s home décor and lifestyle products have a simple elegance that sets them apart. The would-have-been-engineer tells POOL about his sometimes trying but always fulfilling experiences as a design entrepreneur. definition of good design is always in a context, be it price, esthetics, cultural, materials, etc. We always need to be aware of the context while evaluating design success. to design intuitively. I learnt to work with a combination of materials, about the concept of quality and how to take a design concept through production, while trying to preserve its essentials. Tell us about your early years in design. MG: When I graduated from NID, all I wanted to do was to work in leather. I was in love with it. It was a beautiful material with a lovely touch and smell, and challenged me to create something beautiful. However, I failed to find design opportunities in leather that I could work on, so I moved on. I had started to make junk jewelry in my spare time, and moved on to working in the craft sector for a couple of years. After three very exciting years with this company, yearning to get back to product design, I went on to Domus Academy, Milan. After I returned I worked with a company as Design Director for a year, before starting off on my own to explore my own sensibilities in design. I knew. Every new order added a new machine in my workshop and a couple of people. Tattva, a range of curtain hardware, was conceived within a year of my starting out. We started selling through some stores, and found some acceptance. It grew from there and today, Tattva is a complete range of hardware curtain hardware, handles, mortise handles, bath accessories, lighting and signage. It sells from over 250 stores across the country. 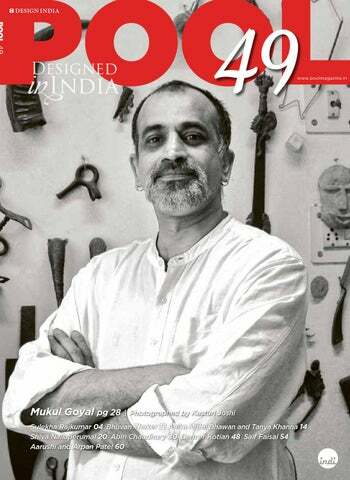 Mukul Goyal, the brand, started out as a different set of standalone objects related to home décor which could be sold through shops. With a small offering in 2004, the collection of objects has redefined itself and today it sells in over 30 countries worldwide, as well as in over 50 stores across the country. 'SWIMMING' 1.8m in height and 4.5m in width. Made in Patinated Brass. Installed at JW Marriott, Chandigarh. What does architecture mean to you? AC: Architecture to me is â&#x20AC;&#x2DC;delineation of space and composition of elements along with the latest technology to create an experience which is sustainable yet visually, physically and spatially appealing to the usersâ&#x20AC;&#x2122;. I believe in a holistic approach to design. research for every project in terms of contextual parameters. illustrator that I had had enough of academics. I’ve always been creatively inclined, so as a big surprise, I decided to pursue a career in the fine arts, much to the vexation of my parents. They did eventually support my decision however and I joined Rachana Sansad College of Applied Arts and Craft in Mumbai to get a Bachelor’s degree in Applied Arts and Advertising. The rest, as they say, is history. What mediums do you work with? DK: I’m not really picky when it comes to mediums in art. I’ve worked with oils, acrylics, watercolors, poster paints, watercolor pencils, charcoal, felt tips, ink and pigment liners to name a few. It all depends on the project I’m working on and client requirements. I believe in experimentation and I don’t like to stick to one particular style or medium. For the past few years however, most of my personal work has been digital. It’s a very forgiving medium and not to mention the cheapest. I’ve recently begun dabbling in oils once again. It has to be my favorite out of all the available media. what inspires you it’s easy to build a style out of that. Lastly, do not let others dictate your individual style. This applies to art as much as it applies to fashion. If you’re comfortable using a style and if you have your own distinct sense of it then do not be afraid to show it. What are your favorite pieces of work? illustrator than hire an artist who is stuck in his or her ways. And ironically, the thing I’ve noticed is that most clients tend to give artists free rein in determining the style for their projects. So as an artist, one needs to be able to determine what style will best suit the project and the client’s needs, and gives them the best bang for their buck. What emerging trends do you see in the design industry, and especially in illustration? the artwork but rather only viewable from other perspectives. Two or more seemingly unconnected elements that when brought together create an entirely new idea. These factors give layers of depth and meaning to an otherwise visually simple artwork without over-complicating its visual space. Now this isn’t a new factor or trend but it’s been gaining prominence in recent years. Philosophy, theology and other intellectual bravura are gaining a greater foothold in today’s art world, thereby creating a new, braver world for art to move forward into. What is your dream for the next five years? (in Karnataka), amidst which I played, made me curious to know more about architecture and design history. industrial design design thought, and also inspires me in my personal life. The design movements of De Stijl and Bauhaus, and Nordic, Japanese and Scandinavian design cultures inspire me. The people in my life also inspire me - my parents and family, mentors and my wife Ayesha who is an architect and my best critic. What plans do you have for the future? SF: To develop furniture and lighting for international producers and continue the interdisciplinary design practice. I would like to get into academics; I have been part of certain design workshops for design schools and high schools. Aarushi and Arpan Patel of Jaipur-based Kassa have created a range of hand-crafted bags and accessories that indulges their passion for leather his Master’s in Product Design from the University of Arts London. He worked independently on an art project called ‘Tea Stories’ for his solo show last year at Jehangir Art Gallery, Mumbai. accessory design a rustic yet finished appeal. Each product is therefore, by its nature, a limited edition and an art piece. Our work has been influenced by the key idea to establish our brand among the high-end fashion labels, maintaining a standard level of finishing and detailing. What does your design process entail? Kassa: We both dream like artists and think like entrepreneurs. After working in leather we found that there was a lot of scope and design potential in this area as yet undiscovered in the Indian market. This led us to experiment with various possible design themes. We believe in creating something that is uniquely our own and with our mute touch. Something that we would see, fall in love with, buy and use. We follow both the design processes – form follows function, and vice versa. Our design fits in harmoniously with the contrasting nature of various techniques. Reusing, recycling and re-interpretation of materials is one of the major processes and the base of modern functionality and utility. What materials do you use? Kassa: We are working with leather, canvas, felt and cloth right now; of these, leather is the core and crux. We are also very experimental with materials such as wood, mehendi, lacquer, cement, porcelain, damar (raw material used in roads), brass, metal, terracotta, etc. accessory design there is something for everyone. We also keep collecting interesting pieces on our travels, and photography of all things beautiful is a great inspirational database.